House Speaker Nancy Pelosi said last week that she was misled by the CIA about the use of enhanced interrogation techniques. WASHINGTON (CNN) - As Nancy Pelosi continues to face a firestorm over what she may have known about aggressive government interrogation techniques, and when, a new survey has more unpleasant news for the House Speaker. Nearly half of all Americans - 48 percent - disapprove of how the California Democrat she is handling her job as Speaker of the House in a CNN/Opinion Research Corporation poll released Monday, while 39 percent approve of her performance. That rating makes her less popular than other members of her party - congressional Democrats drew a 51 percent approval rating in last month's CNN/ORC survey - and roughly in line with the congressional GOP, which drew positive ratings in April from just 39 percent of those polled. The telephone poll of 1,010 Americans was conducted May 14-17, and has a sampling error of plus or minus 3 percentage points. You know if it wasnt for the media's obsession with Obama and their refusal to say anything critical about him the democrat party otherwise is a mess. The other leaders, Nancy Pelosi, Harry Reid, Chris Dodd, Barney Frank, John Murtha and Charlie Rangel are horrible leaders, the majority of them in scandals and if they were republicans, the media would have forced them to resign already. But oh what a double standard in the MSM. In 2002 we were still reeling from the worst terrorist attack upon Americans EVER (under GWB and Cheney's watch) and rather than them chasing the right guy, they decided to try to fabricate a link between Iraq and Al Qaeda, waterboard prisoners of war (not to make Americans safer but to confirm the non-existent link) and embolden themselves where absolute power from the Patriot Act had corrupted absolutely. Now they're just using distractions trying to blame Pelosi for knowing what THEY were doing, just to keep us from noticing how many times Cheney publicly confesses his crimes. First, I don't care if we did toture these thugs. These Terrorists do not reserve any rights or protection, so screw wha the liberals think. As for Nancy, she is worthless. A proven liar. And people though Palin was incompetent. 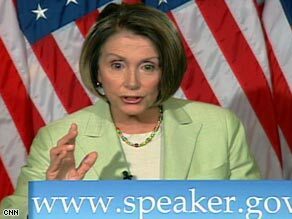 What had Nancy Pelosi ever done or managed? Hmmmm, nothing but her 5 pounds of make up. Her popularity suffers because she's the everpresent bogeyman of the right. I doubt they'd attack her so much if she were not a woman. How absurd is it for them to be calling for her resignation for her alleged role in the torture fiasco when they refuse to acknowledge the much bigger role played by the Bush admin. Prosecute those who ordered and carried out torture. Then we can get to speaker Pelosi. Gingrich cheated on his wife while she was dying with cancer. Trash. Pelosi is arrogant, probably lies and is offensive. More trash. This is what I call a true bi-partisan effort !!! You really need to look at other polls than CNN. You might even want to look at other news media. You might even want to get out more. No, Todd, you're wrong. We don't know beyond a shadow of doubt that torture took place. What everyone seems to be missing is that the memos "defined" what was torture and what wasn't. What was done was in accordance with those memos. We now have a new administration with new lawyers with a differing opinion on the definition of torture. All that is going on now is a debate on legal opinion. The next administration may reaffirm these memos or may decide that the bombing of Pakistan being done by this administration constitutes a war crime. This is what happens when we let lawyers rule the country. Maybe we should start electing more CPAs to Congress. Then maybe the economy would be safer. Go Nancy, pull the rest of the Democrat party down with you! I think Nancy is a wonderful example of the Democratic Party,the media needs to continue bringing out the true stories of all of the Democrats so everyone knows who and what they are voting for in 2010. I'm for saving American lives(yours and your families) and I think whatever it takes to achieve that goal is worth it,even if you don't agree,you will the next time we are attacked and it's you and your family that is involved directly.It's easy to be judgmental when your not involved. Bill, if it's your daughter, then obviously she believes in torture as well. I would let the kidnappers go. Heck, I would send them medals for getting rid of a cowardly scum bag that endorses torture. Cowards use torture. The land of the Brave should NOT. Incompetent, terrorist twisted cowards are the only ones who would choose to take a life of no moral code rather then die with honor. Nancy knew about the torture, condoned it and now wants to backpedal and say she knew nothing. She is as crooked as every other politician out there. Vote ALL of the bums out and vote FOR term limits! this nothing but one of many attempts by republicans to gain back power if they could blame barbara bush for their fiasco and win back seats in congress they would surely do it in a heartbeat. The whole Democratic Party is just a house of cards built on anti-Bush rhetoric and Speaker Pelosi is a prime example. The funny thing is that once they fooled enough of the people once and finally have a little responsibility they are taking that opportunity to reinforce their reputation as out-of-control spenders and then making so many decisions exactly like the ones they campaigned against. I just hope we have already seen the worst of their 'leadership' problems, but I'm sure we haven't. I'm sure the big question they will have to answer come election time is," Where did all the money go?". yes, she will stay the same.